The Otter Lake and Old Forge Fire Departments will open their doors to area residents this weekend so they can learn about what it takes to be a volunteer firefighter in their community as part of the fourth annual Recruit NY statewide initiative. This entry was posted in admin and tagged old forge fire dept, otter lake fire dept, recruit NY, volunteers on April 24, 2014 by Gina Greco. The Adirondack Bank Charity Golf Classic is scheduled at the Thendara Golf Club for Monday, June 23 and the Charity Selection Committee is seeking letters of interest from local non-profit organizations that would like to be considered as recipients of funds from the charitable event. This entry was posted in admin and tagged adirondack bank, charity, golf tournament, Thendara Golf Club on April 24, 2014 by Gina Greco. While treating a swampy area on the south shore of Third Lake with Bti on Tuesday, April 22, Ryan Thompson of the Town of Webb Bti crew spotted a moose in the distance. When he and a fellow worker went to take a closer look at it, they saw that its tracks led out to a point, onto the sand and out into the water. Local photographer Clark Lubbs captured this image of a moose in his back yard. 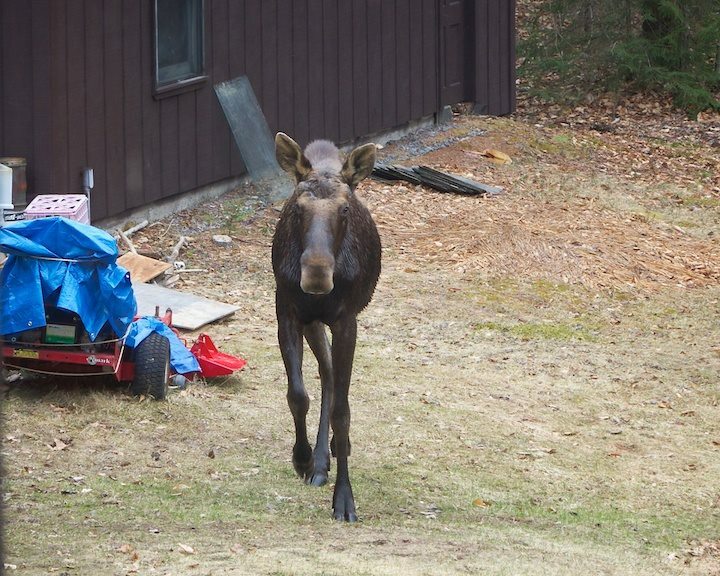 This entry was posted in admin and tagged moose, sighting on April 24, 2014 by Marianne Christy. Michael Lamphear was unanimously elected Fire Chief of the Raquette Lake Fire Depart-ment at elections held at the Raquette Lake Fire Hall on Friday, April 4th. Lamphear, who previously served as 2nd Assistant Chief, was nominated by out-going Chief Mark Bird. This entry was posted in admin and tagged fire chief, fire dept., Raquette Lake on April 24, 2014 by Gina Greco. The Government Intern Program, sponsored by the Herkimer County Legislature and administered by Cornell Cooperative Extension 4-H Youth Development Program of Herkimer County, concluded another successful semester. This entry was posted in admin and tagged 4-H, town of webb school on April 24, 2014 by Gina Greco. All Central Adirondack residents are reminded that Wednesday, May 7th is Community Pride Day. All volunteers are being asked to check in and sign up early for a section of roadway and reserve a shirt size. This entry was posted in admin and tagged community pride day on April 24, 2014 by Gina Greco. The Kiwanis Club of the Central Adirondacks and Town of Webb School Key Club will bring Karvell the Magician to the Town of Webb School on Wednesday, May 7 to present an anti-drug program, There is No Magic in Drugs. This entry was posted in admin and tagged anti-drug, kiwanis club on April 24, 2014 by Gina Greco.